Alzheimer’s disease (AD) patients exhibit neuroinflammation consistent with infection, including microglial activation, inflammasome activation, complement activation, and altered cytokine profiles. Infectious agents have been found in the brain and postulated to be involved with AD, but robust evidence of causation has not been established. The recent characterization of amyloid-β (Aβ) as an antimicrobial peptide has renewed interest in identifying a possible infectious cause of AD. 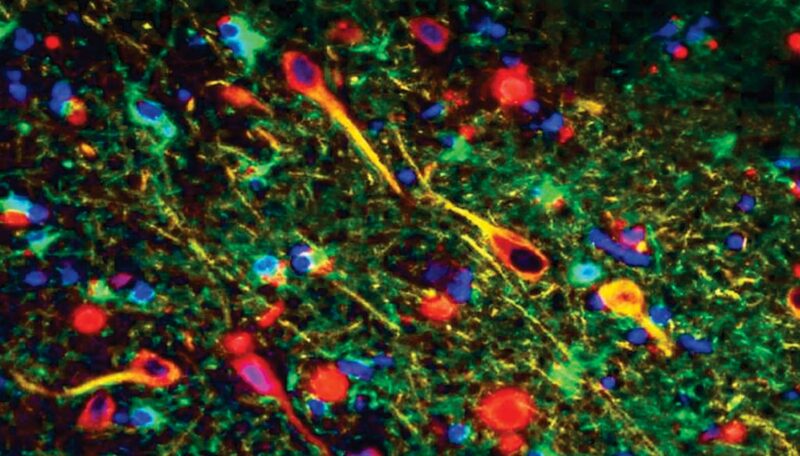 Image: Porphyromonas gingivalis gingipains in the neurons of Alzheimer\'s brain. P. gingivalis gingipains = red, neurons = yellow, astrocytes = green (Photo courtesy of Cortexyme). An international team of scientists including those from the University of Louisville School of Dentistry (Louisville, KY, USA) investigated the prevalence of Porphyromonas gingivalis in the AD brain and to elucidate possible P. gingivalis–dependent mechanisms of action for neurodegeneration and AD pathology. P. gingivalis is mainly found during gingival and periodontal infections; however, it can also be found at low levels in 25% of healthy individuals with no oral disease. The team obtained human postmortem brain tissues and independent pathological analysis confirmed that any amyloid pathology was deemed normal for age in the control cases selected for this study. Human brain tissue microarrays (TMAs) comprised a total of 58 2-mm-diameter core samples, 29 from dementia-free control individuals and 29 from AD cases, each on two arrays. Gingipain antibodies were optimized initially on formalin-fixed paraffin-embedded sections of gingival tissue collected from periodontal disease patients. Histological analysis was performed on an Olympus BX61 motorized microscope. Several molecular techniques were used to identify other factors in the study. The study team found the organism's toxic enzymes, or gingipains, in the neurons of patients with AD. Gingipains are secreted and transported to outer bacterial membrane surfaces and have been shown to mediate the toxicity of P. gingivalis in a variety of cells. The team correlated the gingipain levels with pathology related to two markers: tau, a protein needed for normal neuronal function, and ubiquitin, a small protein tag that marks damaged proteins. In animal models, oral P. gingivalis infection led to brain colonization and increased production of amyloid beta (Aβ), a component of the amyloid plaques commonly associated with AD. In preclinical studies the scientists demonstrated that by inhibiting the compound COR388, there was reduced bacterial load of an established P. gingivalis brain infection, blocked Aβ42 production, reduced neuroinflammation and protected neurons in the hippocampus, the part of the brain that mediates memory and frequently atrophies early in the development of AD. The study was published on January 23, 2019, in the journal Science Advances.